"This is a specific formula for achieving a perfectly pink prime rib cooked somewhere a shade under medium rare. To use this method you must have a full-sized, modern oven with a digital temperature setting that indicates when it is preheated. Older ovens with manual controls can vary greatly, and the doors may not have the proper insulation." Place rib roast on a plate and bring to room temperature, about 4 hours. Preheat an oven to 500 degrees F (260 degrees C). Combine butter, pepper, and herbes de Provence in a bowl; mix until well blended. Spread butter mixture evenly over entire roast. Season roast generously with kosher salt. Roast the 4-pound prime rib (see footnote if using a larger and smaller roast) in the preheated oven for 20 minutes. Turn the oven off and, leaving the roast in the oven with the door closed, let the roast sit in the oven for 2 hours. Remove roast from the oven, slice, and serve. Your cooking times will vary depending on the size of your prime rib roast. To calculate your cooking time, multiply the exact weight of the roast by 5. Round the resulting number to the nearest whole number. The rib is cooked at 500 degrees F for exactly that many minutes. For example, for a 6 pound roast: 6x5=30, so cooking time is 30 minutes. Turn the oven off and wait 2 hours before opening the oven door. Remove the prime rib and slice into the most perfectly medium-rare meat you've ever seen. Chef John serves this with his Beef Au Jus. 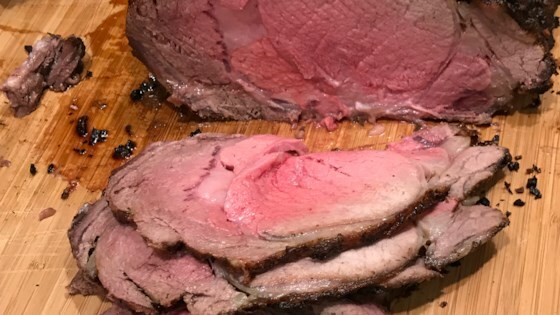 Absolutely, the easiest way to make perfect prime rib every time. But do not be tempted to open up the oven door until time is up.